(Nanowerk News) An international team of scientists has discovered striking similarities between the human brain, the nervous system of a worm, and a computer chip. The finding is reported in the journal PloS Computational Biology today. "Brains are often compared to computers, but apart from the trivial fact that both process information using a complex pattern of connections in a physical space, it has been unclear whether this is more than just a metaphor," said Danielle Bassett, first author and a postdoctoral research associate in the Department of Physics at UC Santa Barbara. 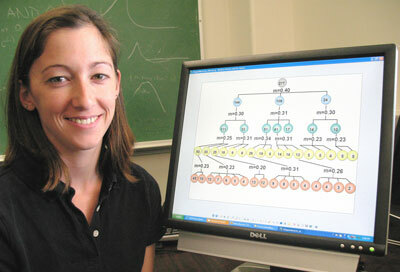 Danielle Bassett with a depiction of the neuronal system of the nematode worm, C. elegans. The team of scientists from the U.S., the U.K., and Germany has uncovered novel quantitative organizational principles that underlie the network organizations of the human brain, high performance computer circuits, and the nervous system of the worm, known as nematode C. elegans. Using data that is largely in the public domain, including magnetic resonance imaging data from human brains, a map of the nematode's nervous system, and a standard computer chip, they examined how the elements in each system are networked together. They found that all three shared two basic properties. First, the human brain, the nematode's nervous system, and the computer chip all have a Russian doll-like architecture, with the same patterns repeating over and over again at different scales. Second, all three showed what is known as Rent's scaling, a rule used to describe the relationship between the number of elements in a given area and the number of links between them. Worm brains may seem to have very little in common with human brains and even less in common with computer circuits, explained Bassett. In fact, each of these systems contains a pattern of connections that are locked solidly in a physical space, similar to how the tracks in a railway system are locked solidly to the ground, forming traffic paths that have fixed GPS coordinates. A computer chip starts out as an abstract connectivity pattern, which can perform a specific function. Stage two involves mapping that connectivity pattern onto the two-dimensional surface of the chip. This mapping is a key step and must be done carefully in order to minimize the total length of wires –– a powerful predictor of the cost of manufacturing a chip –– while maintaining the abstract connectivity or function. "Brains are similarly characterized by a precise connectivity which allows the organism to function, but are constrained by the metabolic costs associated with the development and maintenance of long 'wires,' or neurons," said Bassett. She explained that, given the similar constraints in brains and chips, it seems that both evolution and technological innovation have developed the same solutions to optimal mapping patterns. She explained that this scaling result may further explain a well-known but little-understood relationship between the processing elements (neuronal cell bodies, or gray matter) and wiring (axons, or white matter) in the brains of a wide range of differently sized mammals –– from mouse to opossum to sea lion –– further suggesting that these principles of nervous system design are highly conserved across species. This work suggests that market-driven human invention and natural selection have negotiated trade-offs between cost and complexity in designing both types of information processing network: brains and computer circuits. Bassett worked closely with Edward Bullmore, professor of psychiatry at the University of Cambridge. He explained: "These striking similarities can probably be explained because they represent the most efficient way of wiring a complex network in a confined physical space –– be that a three-dimensional human brain or a two-dimensional computer chip."